Variety. Some say it is the spice of life. I created this lasagna to add a little variety to my upcoming cookbook. So many times, we cook the SAME ‘OL foods! How many different ways can you eat cauliflower?? I love both spinach and sweet potatoes, but don’t cook with either that much. Sweet potatoes are very nutritious but they are pretty carby, so if I eat them, I like combining them with other foods. In this recipe, the thinly sliced sweet potato make the PERFECT lasagna noodle! I think EVERYONE will LOVE this recipe! 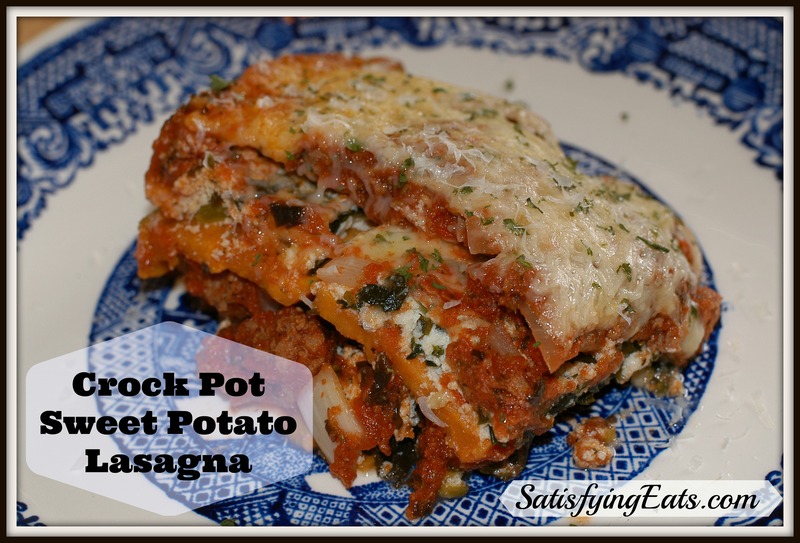 Another great thing about this Lasagna is that you can cook it in your Crock Pot (slow cooker) or in the oven. The night I made the lasagna in the picture, I put it on low in my Crock Pot, and HOPED and PRAYED that I wouldn’t over-cook it. Well at 4 am in the morning, it was OVERCOOKED! ;-( If I had a fancy slow cooker , I could have programmed it to cook for only 6 hours. Here is where my quest for a new slow cooker began! Ability to use the Pot on top of the stove to brown meat before cooking. Delayed Start sounds nice but may not be needed. Probe sounds nice but not really necessary. Dishwasher Safe would be nice. Searing the meat is SO important! Yes, this is an extra step but all the yummy flavor that comes out of searing and browning the meat is worth it! I would also like to be able to program the cooker to shut off after a given time so I don’t overcook delicate dishes like this Sweet Potato Lasagna!! 1. Hamilton Beach 33967 Set ‘n Forget 6-Quart Programmable Slow Cooker: This one is what I was going to purchase but realized you can’t put it on cook-top and there is no delayed start. It did have the probe and had clips for the lid that made it portable. At $50, this one is so tempting! 2. Ninja MC701 3-in-1 Cooking System: This one has great reviews. You can also steam and you actually use the base to sear the meat. This would be great for traveling. It is also much lighter than the others! Some of the negatives are the price of over $150, and you can’t put cooking vessel in the dishwasher. 3. Hamilton Beach 33265 6-Quart Programmable Insulated Slow Cooker: Removable crock for searing and browning. No probe. Dishwasher safe, Great price, $70. I think I am going to go with #3, the Hamilton Beach 33265 6-Quart Programmable Insulated Slow Cooker. I am excited to be able to sear meat in the same cooking vessel so I don’t have to dirty another pan! The negatives are that it is not portable but I am ok with that! I will still use my “old faithful” el cheapo crock pot to cook chicken stock or other recipes that are not sensitive to overcooking. I can’t wait for my new cooker to arrive! 😉 If you haven’t used your slow cooker in a while, the time is now! I will have almost 15 new slow cooker recipes in my cookbook (to come out in October ’13) and there are over 25 Crock Pot recipes available NOW in my Satisfying Eats Cookbook! This recipe is a few years old. Back then, you didn’t cook everything in a pressure cooker but now you can! 🙂 I currently have THIS one and love it. This is the perfect recipe for batch cooking and stocking your freezer with a delicious meal to be enjoyed later. I doubled the recipe but used 2 full pounds of mozzarella cheese and added an extra sweet potato to the mix and ended up with over 15 lbs of lasagna! I made 1 lb tins and 2 lb tins. The 1 lb tins serve 2 and the 2 lb tins serve 4 (I feel it is a big enough portion size especially if you have a side like a salad or some yummy green beans)! I have these in my freezer for myself but also plan on gifting some to others. You can bake them first and then freeze for just bake them when you are ready to eat them. This recipe is really pretty easy! Use whatever meat you like or have on hand. I used grass-fed beef but any meat would work. The cooking time may vary from slow cooker to slow cooker. Since everything else is cooked, the main ingredient you need to cook is the sweet potato. In the picture below, I overcooked the lasagna by 2 hours. It was still VERY good but the cheese got very brown and the sweet potatoes were very soft. A little resistance would have been great from the potato to mimic real lasagna noodles. The slow cooking of the meat sauce really brings out the flavors without having to cook it on top of the stove for hours!! Don’t get me wrong, I LOVE fresh herbs! The problems I run in to when using fresh herbs is that they go bad before I finish using them, and I don’t like to waste money! ;-( I also find the dried herbs to be much more convenient… no need to get a cutting board out! You can also purchase organic dried herbs pretty easily. 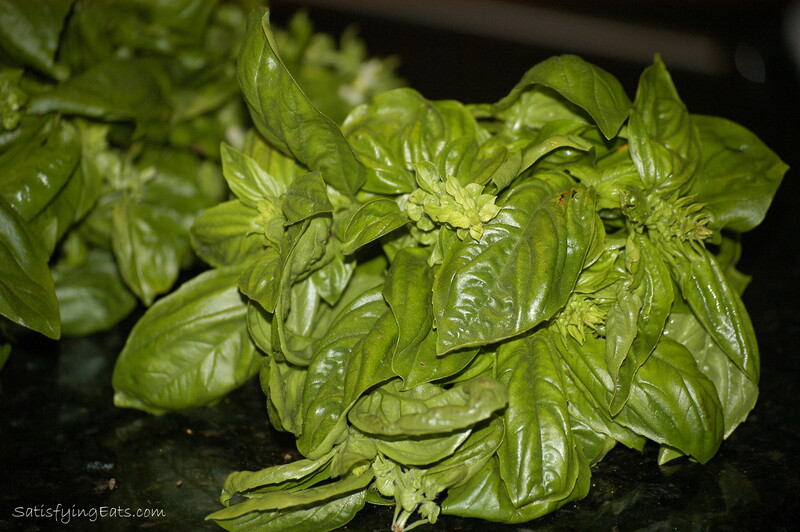 Right now I have fresh basil, thyme and sage in the fridge but I tend to still reach for the dried stuff! My favorite fresh herb is basil, but since this recipe is supposed to be a quick, slow cooker meal, so I decided to use dried instead. If using fresh herbs, the typical conversion is to use 3 times as much fresh herbs as you would dried. Be sure to choose high quality dairy products. Look for “carrageenan” on the ingredient list of any dairy you buy and AVOID it! Check out this blog post for more information about carrageenan as a food additive. This recipe would be GREAT with homemade mozzarella! You could also use eggplant or zucchini instead of sweet potato or use all three. The disadvantage of using the zucchini is that your lasagna will have extra liquid given off from the zucchini. If you use eggplant, just be sure to peel it first before you slice it. This lasagna is a great way to highlight fresh tomatoes you put up this summer. Try this recipe the slow cooker or in the oven! If you prepare it in a freezer safe dish, you can make it ahead of time, and store it in the freezer for a rainy day. I hope you enjoy this easy but tasty recipe! **Dairy Free Option: This recipe is great with cheese but if you can’t handle, dairy, simply omit it. In a large frying pan, brown the ground beef and drain any excess oil. Add meat back to pan as well as the remaining ingredients for sauce. Stir and set aside. In a medium bowl, blend Spinach, ricotta, salt and nutmeg. Blend well and set a side. Arrange Lasagna in Crock Pot: Spread 1/3 of meat sauce in bottom of large crock pot. Then place half of the sweet potato slices (sprinkle with a little bit of salt) followed by ½ the spinach mixture. Be sure to spread spinach mixture over entire surface of sweet potatoes. Then top with 1 cup of cheese. Repeat all the layers once and finish off with the last bit of meat sauce and the remaining cup of cheese. Cook on low for 6 hours or high for 3-4 hours or until sweet potatoes are tender and cheese is slightly browned. Top with grated Parmesan cheese and parsley. Oven directions: Bake at 400 degrees F for 45-60 minutes or until sweet potatoes are tender and cheese is melted. For the PERFECT meal, serve with Better than Red Lobster Biscuits! Disclaimer Some of the links contained in this post are Affiliate Links. If you purchase through the links provided, I will receive a small (very small) commission which I used to buy more ingredients to create more recipes. I have chosen these products not to receive a commission but because I think they are the best on the market, and ingredients I actually use. Thank you for your continued support! I don’t know what the the abbreviations are either. However, I made this recipe and my family (husband, 2 teenagers) really enjoyed it! It was delicious. I ordered your cookbook from Kindle. My husband and I are grain/sugar free, and my kids eat what we eat for dinner. I also enjoyed the zucchini muffins, they texture and flavour was excellent! THM is the book Trim Healthy Mama (excellent read! and plan!) S, E, FP refer to the style of eathing, Satisfying, Energizing, Fuel Pull. trimhealthymama.com Gives you info, so many of your recipes are perfect for the THM plan. Thank you for the amazing blog!! I’m thinking it would be a bit of a cross over, unless the cheese was low fat, and then I would say with the carb content it would be an E. That’s how I plan to make it, and then have it with a sour dough bread stick and a big salad! Yum! Made the lasagna and biscuits for dinner, cooked the lasagna in the oven though. Half my family are gluten free and the other half not. It was a huge success with everyone! 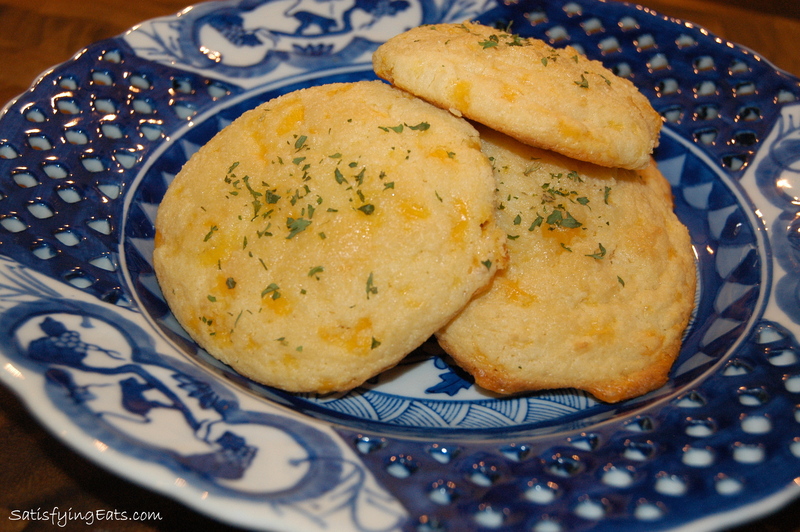 The biscuits were so delicious that I am making a triple batch for the freezer tonight, I envision ham/egg biscuits for breakfast for the not gluten free part of the family. To help prevent watery zucchini, if you cut them in quarters lengthwise, and then cut triange of seeds out, that will cut down a lot. I grill lots of zucchini, and that is what I do with zucchini and yellow squash. You can get much better grill marks if grilling. In casseroles, a lot less watery consistency. I have made this recipe several times (at least twice a month since I first read this post), and i always seem to make little modifications that make it seem like a completely different dish. For example, chorizo or spicy italian sausage instead of ground beef, and i always use fresh mozzarella. I am making my first one in the slow cooker today, and I sauteed some mushrooms in with the sauce. I am slobbering a little just thinking about it! Well i am gonna try this first time.The color look good and hope that its taste delicious to because my hand in cooking is bit tense..:). But mate keep coming with new idea and more dishes. Have you considered an Instant Pot? I love mine. Hi Alexa, this is an older recipe before IPs were so popular. I have one now and will be converting this recipe soon! I will be updating the recipe soon with IP instructions!